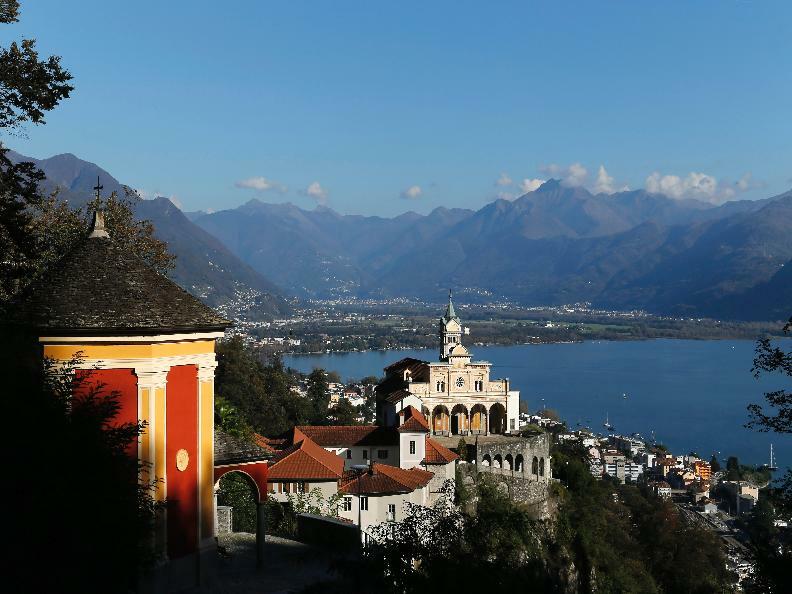 The sanctuary of the Madonna del Sasso in Orselina is firmly rooted in the ancient votive tradition, and one of the most important Sacro Monte (sacred mountain) in the Italian part of Switzerland. This itinerary follows the path of the pilgrims who used to climb up the hillside to elicit help or give thanks for salvation from peril after the intercession of the Virgin Mary. A visit to the basilica can be followed by a look round the most substantial collection of ex voto in the canton. 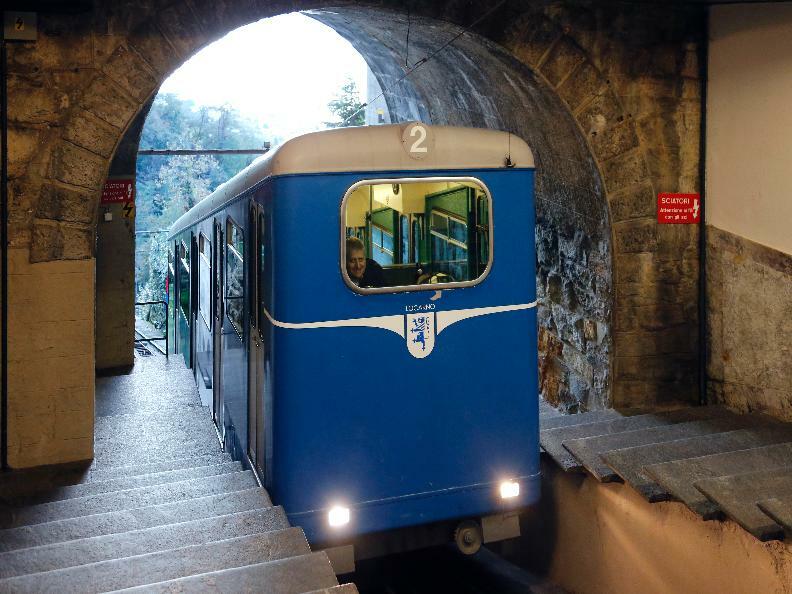 The most appropriate starting point is the foot of the mountain; coming from the direction of the arcades in Piazza Grande, Locarno, turn left up via delle Monache, then via Cappuccini and via al Sasso, up to the Chiesa dell'Annunciazione and the chapels of S. Giuseppe and the Visitation. Immediately afterwards the path divides, at a point where a painting records the miraculous appearance of the Madonna in 1480; to the left the steep via Crucis winds up the mountain, and to the right the overgrown wild valley path of the chapels, which have unfortunately almost all disappeared over the years (one of the few still standing shelters a group of sculptured figures). Both paths lead to the sanctuary and convent, at the top of the Sacro Monte, which can be reached in less than half an hour. The entrance to the church leads into a courtyard overlooking the living quarters of the monks; opposite is a chapel with a 15thC Gothic-Lombard altarpiece depicting an intense Pietà; to the right the entrance to the original home of the friars («casa del padre»), now a museum containing a considerable number of ex voto. In the nearby Von Roll chapel is a group of 14thC wooden figures representing the Scene of Affliction in the Holy Sepulchre. Climbing up the stairs you come to the Chapel of the Last Supper made of terracotta figure, attributed to Francesco Silva di Morbio (first half of 17thC), then the chapel of the Holy Spirit, also attributed to Silva, and a large Crucifix. The last flight of steps leads up to the church and courtyard; from here a vast panorama sweeps to the horizon, framed by the lake and mountains. The Sacro Monte is an architectural complex which includes the church of the Annunciation, the Via Crucis, the path of the Chapels, the basilica of the Madonna del Sasso and the convent. The original complex was built between 1485-87, starting with a chapel of the statue of the Virgin; this was undertaken on the initiative of Fra' Bartolomeo da Ivrea, a Franciscan brother from the convent of Locarno. Tradition has it that on that very spot, on the night between 14th and 15th August 1480, the Madonna appeared to fra' Bartolomeo with the child Jesus in her arms. Following this vision he withdrew to the hillside to pray, living in a cave. Documents from that time make no mention of the apparition, referring only to legacies and sales connected with the founding of a centre of Marian devotion on the rocky spur between the two branches of the Ramogna (a torrent). The first description of miraculous events is recorded much later, in 1625. We are not sure if Fra' Bartolomeo himself was responsible for the idea of a Sacro Monte (he died some time between 1511 and 1513); what is certain is that a cult of devotion grew up around the 'Sasso' (rock) which soon meant that the original chapel was too small; it was enlarged and becoming a full size church between 16thC and 17thC; the hermitage became the convent. The plan to create a Sacro Monte, (a form of religious architecture very popular at the time in the area around the lakes (Varese, Orta, Varallo), was only partially successful. The church of the Annunciation was built at the foot of the mountain, as well as several chapels along the path that rises through the shadowy valley, but not much remains today. Around 1617 - 1619 a new path was opened with the intention of dedicating it to the Holy Rosary; two hundred years later the chapels along the Via Crucis were painted (1817). At that time Ticino had just acquired its political identity; history relates that half way through the 19thC the Capuchin monks arrived at Sasso, and launched a campaign of restoration work on both convent and church. 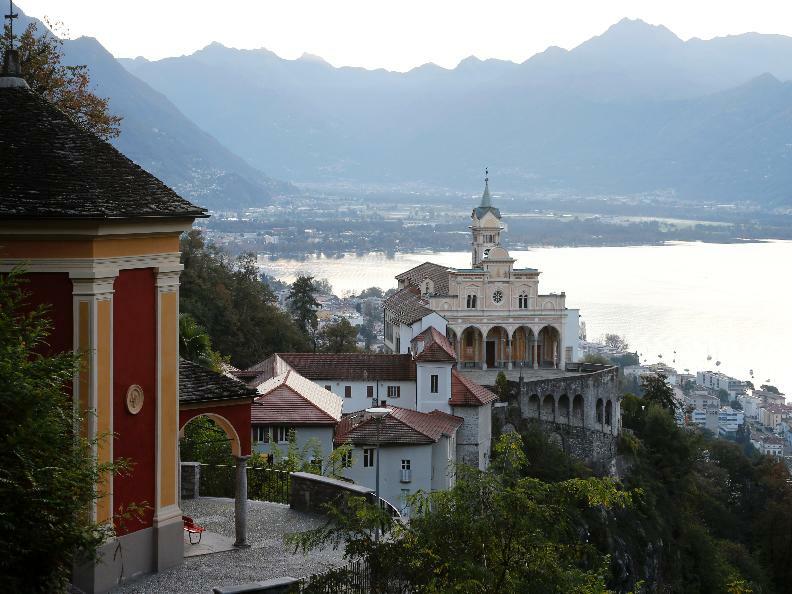 The most recent restoration was carried out in 1980, the year of the 500th anniversary of the Madonna del Sasso; by this time the church had become the largest pilgrim centre in Italian Switzerland. The façade of the church , (restored in 19thC), looks into a large square from which you can get a glimpse of the rocky mountain side and the wild valley. 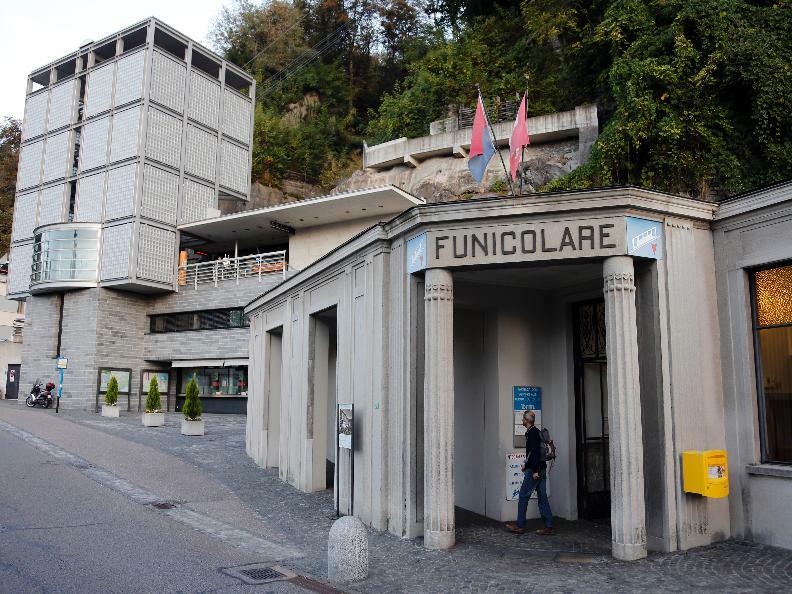 To the side of the church is a porticoed loggia with a wonderful view over the whole of Locarno. Inside, the church is divided into a central nave with two side aisles; the vaulted ceiling is covered with frescoes and stucco decorations. An altarpiece depicting the Flight into Egypt by Bartolomeo Suardi (known as il Bramantino) in ca.1520 can be seen in the right hand aisle; in the aisle to the left is a representation of the Transposition of Christ to the Sepulchre , painted by Antonio Ciseri di Ronco sopra Ascona in Florence ca.1870 (preparatory sketches are on display in the museum next door). Among other works of art preserved in the basilica are the Annunciation by Bernardino di Conti (ca.1500) and the Transition of the Virgin, a late 17thC painting. The focal point of the church is the main altar (1792) bearing a 15thC carved wooden statue of the Madonna del Sasso . Evidence of Marian devotion can be seen in hundreds of ex-voto; painted tablets, embroidery, banners, silver hearts, and simple thank you notes. Expressions of despair and renewed hope, which carry over into the museum, where a number of the ex voto displayed recount the history of the church. There are also two collections of Italian origin in the museum, both acquired in 2001; they illustrate rural culture from 1800 through to 1930. More than 150 ex voto span several centuries, particularly 19thC and 20thC; ther eis one from 1733 and several modern examples; 35 were painted by Vanoni , an artist from Vallemaggia. Looking at these illustrations one can follow the evolution of everyday life in the Canton. The accidents used to involve carts, carriages and stage coaches; then trains, trams and automobiles. Rural accidents involving snake bites and falls into torrents, have been replaced by traffic accidents , building site disasters and city life in general; town scenes have replaced country scenes; last but not least the eternal dramas of life; disease, fire , drowning, epidemics , avalanches, floods and war . Some people have offered more than one ex voto, for example the multiple ex voto (1812-1835) showing scenes of four disasters all survived by the same person . Twelve stations of the Cross, coloured yellow and brick red, illustrating scenes from the Passion in cast iron. with one surviving chapel containing sculptured figures of the Nativity and the Adoration of the Magi. original residence of the friars, enlarged in 1535. Now a museum containing tapestries, sacred hangings, rich Marian iconography, ex voto. group of wooden figures representing the Sorrows of Christ. Crucifix by Milo Cleis from Ligornetto 1985.